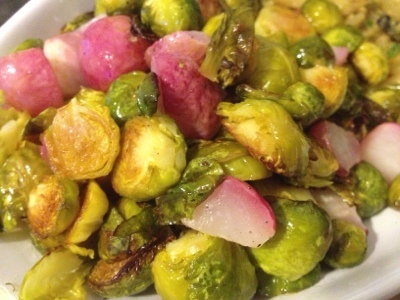 Coat the sprouts and radishes in the olive oil, salt and pepper. Roast the veggies in the oven until the sprouts start to brown and crisp; about 20-30 minutes, or so. While the veggies are cooking, simmer the balsamic on the stove until it reduces by half and gets thick. When the veggies are done, plate them and serve with a drizzle of the balsamic vinegar reduction. This is so yummy. 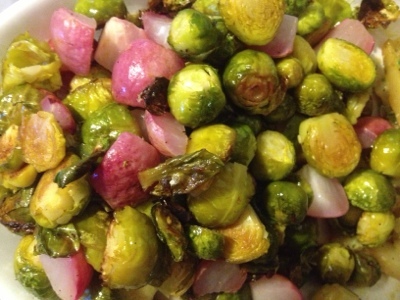 I'd never had radishes before I tried this dish and now I love them!